Corrie is hostess this week over at the Stampotique Designer's challenge and the topic of the week is "ribbons." Incorporate some ribbon in your stamped project and enter your creation for our monthly drawing to win a $30.00 voucher to some stamps of your choice. 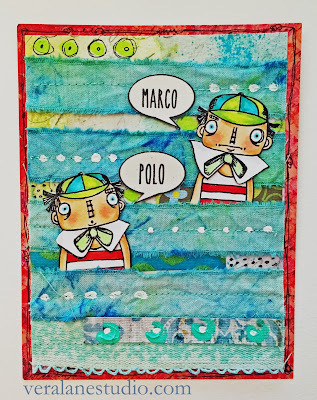 When I saw this challenge I immediately thought about making muslin ribbons dyed with Inktense® blocks. I tore fabric into strips and wet them then applied color and pressed and twisted the fabric. My background is a combination of sprays, Gelatos® and scribbles. I stitched the fabric ribbons with a textured ribbon for the bottom of the card. The Tweedles were stamped and clear embossed then colored with Copics®. I wanted to dress them in swimsuits so I trimmed the image and drew new outfits. 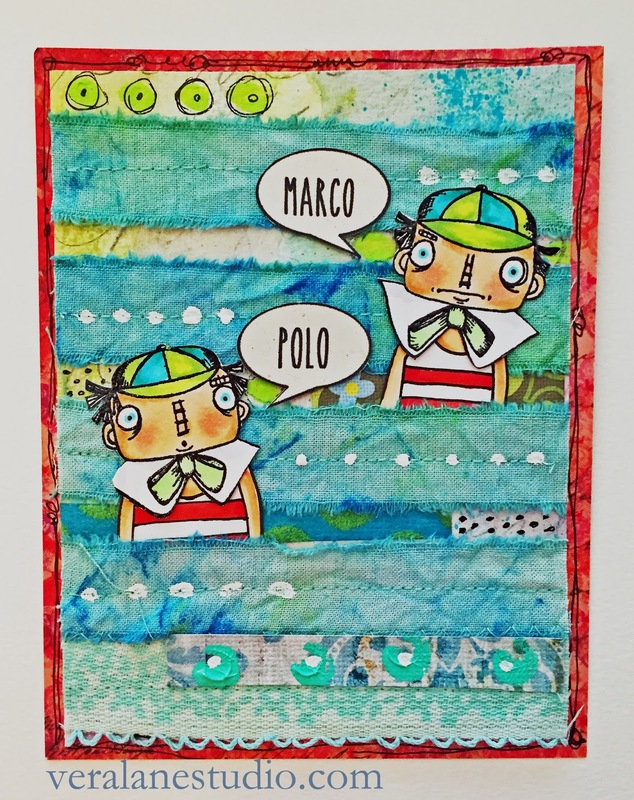 "Marco and Polo" are placed in clip art speech bubbles printed from Microsoft Word®. I added scraps dots and doodles. Kim is hostess this week and is challenging us to celebrate! That's right -- we are in our 200th challenge with the Stampotique Design Team! This week we are creating an anniversary or best wishes card or project. My entry for this week is celebration card revisiting my favorite Beauties stamp. This week I began with a watercolor card and blended Gelatos. I added paint, paint pens, pencil, and scraps. "Party" is printed from the computer. The "Beauties" are stamped and embossed with a touch of Copic coloring. Party hats are added prior to mounting on foam to stand above the background. To mark the 200th Challenge on Wednesday, Arwen is giving away her Goth Tiered Cake and her creation! So create a celebration project of some kind and enter it for our monthly drawing for a $30.00 gift voucher for some great stamps from Stampotique and or a treat from Arwen! 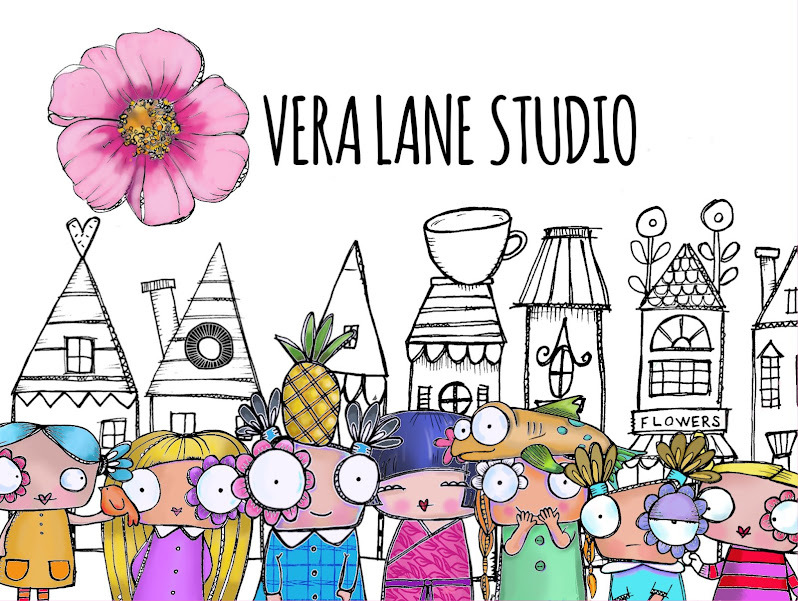 Two new sets are live in the Vera Lane Studio Etsy shop! "Queen of Hearts" and "Coyoacan". These two sets are are in 300 dpi png format but are available in jpeg by request for tablet users. The Queens scepter and dagger are designed to fit over the hand. Reverse the images and they can adapt to either the left or right -- use together, alone or without. "Queen of Hearts" can be used with the other creepy Wonderland characters from Vera Lane Studios. The Latina Collection is inspired by a memorable summer living in Cuernavaca using it as a home base to travel. Coyoacan is a beautiful village and home of Casa Azul, Frida Khalo's home. This four image digi set is inspired by her love of animals. Both sets are open to your interpretation with your paper craft and coloring skills. 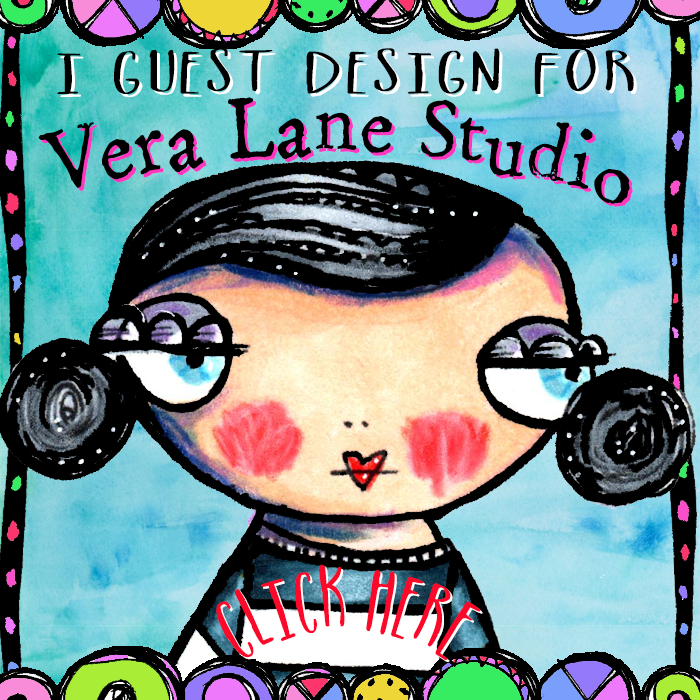 Use Vera Lane Studio versatile sets for your art journals, cards, ATCs and more. 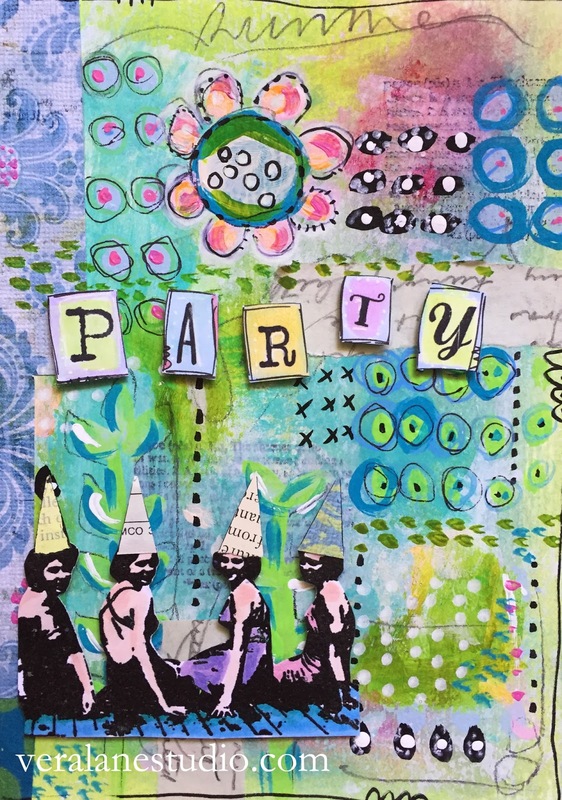 Gez is hostess this week at the Stampotique Designer's Challenge and she is requesting creating with your favorite stamp. I actually don't have a single favorite but this is one of them. I love this because the pretty lady second from the left is my mom and I am missing her terribly this week. The stamp is called "Beauties" (9127). 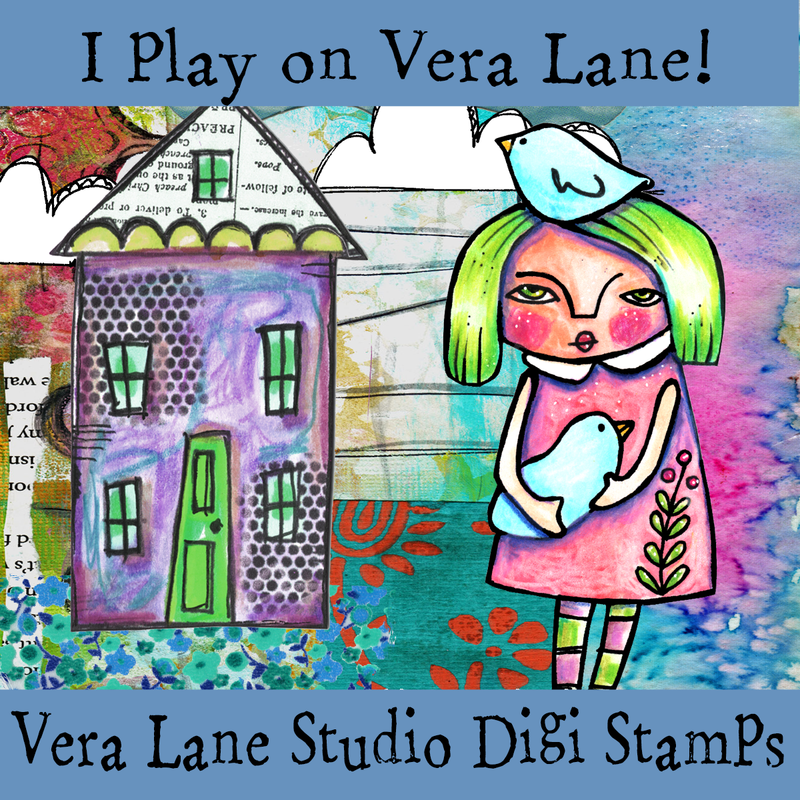 I stamped the image on cardstock and pasted with notebook scrap over a Gelli® print, stitched and painted a border.